Wanderlust 2017 is a year long class and you can read about it via the link above. I am very pleased with the presentation and the instructions I received via video & a pdf for Lesson One and I will share here how I interpreted Kasia Avery's Lesson. We are working in our Art Journals and she coached us on how to create a statement or intention for the year. 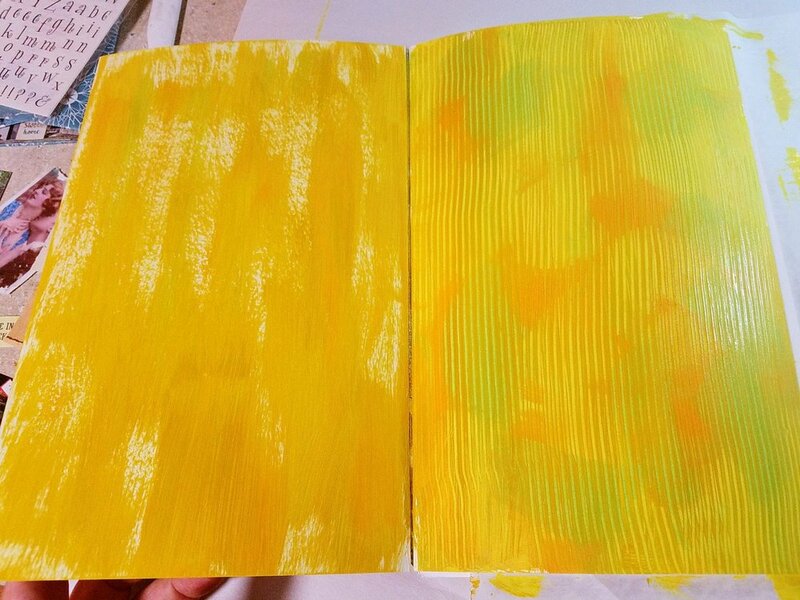 I did not have a journal on hand that felt the right size, so I took 11 x 14 mixed media paper from a pad, cut the paper in half and used duct tape to create a simple journal that will work for now. I am sure I will have more than one journal for this year long class! 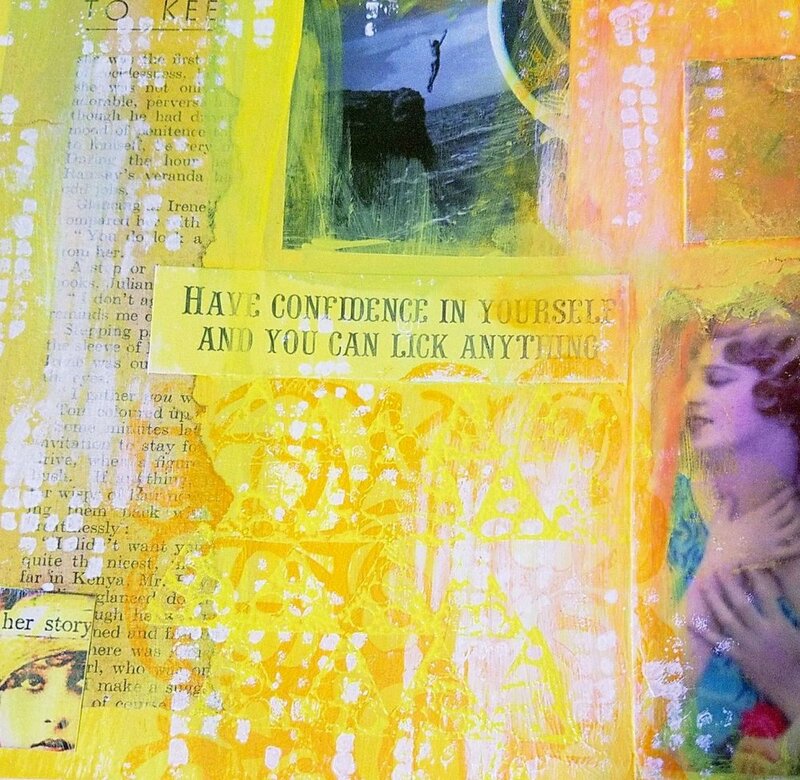 Below: Getting started with acrylic paint, collage and stencils used in various ways.... click on any photo for more details. Below: layered stenciling and bottom photo shares my statement for the year, in regards to art! Detailed look at the finished pages below . . . The collage items I added are all things I love . . . a photo of me & my dad top left, an image transfer I did on fabric top right, My great uncle's artwork and a photo of my Nonie bottom left and a favorite photo of water ripples I took bottom right. It certainly felt good to paint and collage and brainstorm what I want to do -where I want to concentrate my energies! We have been painting and fixing up our home that we rented for the past 4 years, now that the tenant is gone. It was a good experience all around but we are ready to not be landlords anymore! The home should go on the market next week. I've also already been involved with going through my art supplies and re-organizing my studio space. It is coming along and I've arranged things so I have a whole table to work on - the dining table, moved to the room next to my studio!! My beads & jewelry supplies are out of containers and into a nice chest with drawers that belonged to my Nonie!! I have not worked with these items for a while because they were so unorganized. Now they are stored with like items and they are easy to access. Plus, this has left some much needed empty space on the shelves in my studio! Hooray. Still more to do but I am moving through this and feel good. Looking forward to more art and conversation with my art buddies in 2017. I appreciate your visit especially since I have not posted too much lately. That could change! Thank you to my friend Frieda for introducing me to this quote!